Despite a lack of reviews recently I have been drinking some really nice beers. I'm stuck in a bit of a stout phase at the moment and with the relative lack of stout reviews on Beer O'Clock Australia this seemed like the review to post. I was stuck at work last Friday evening but really wanted to go to Purvis for the Yeastie Boys tasting. Dales kindly volunteered/was forced to drive me over and in return he got one of these. It would be wrong though for me to give out a beer without having at least sampled it, so this is mine. 3 Ravens is a local Melbourne micro brewery, located in Thornbury, so freshness shouldn't be a problem. 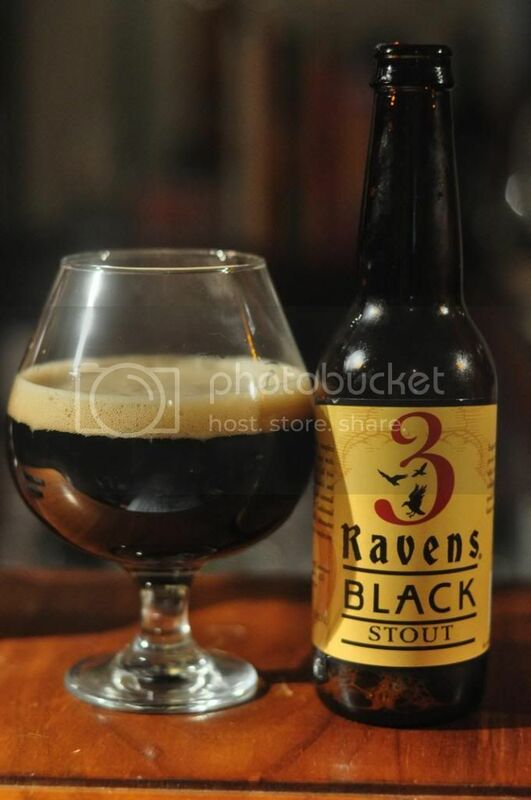 As the name would suggest 3 Ravens Black is as black as any other stout out there. The head is maybe a finger and a half high of beige foam. The head may be a little small but it makes up for that with excellent retention and good lacing. Overall I'm pretty ecstatic with how this stout looks, hopefully it tastes as good as it looks. The nose has heaps of chocolate with only a light roasting smell. I get hints of coffee as well but not alot else. The nose is very simplistic for a stout however it's strangely appealing. It really makes me want to drink it, and drink lots of it! When I said the nose made me want to drink lots of it, the flavour made me want to drink even more of 3 Ravens Black, it's stunning! It's eminently drinkable with a body that is neither over carbonated nor too thick. The flavour is quite simplistic with just large amounts of chocolate and roasted malts, but for some reason this beer just really works for me. 3 Ravens Black really surprised me with how good it was! I would like anyone to find me a better stout in the price range, it was only 20 cents more than a Coopers Stout at Dan Murphy's! The flavour and mouthfeel was everything you could ask for in a stout. It was easy to drink without feeling thin, it's definitely a stout that I will be drinking again, hopefully on tap at the brewery!